Cairo, 20 Sept. 2018: – The African Export-Import Bank (Afreximbank) and the National Bank for Foreign Economic Activity (NBU) of Uzbekistan have entered into a cooperation agreement aimed at strengthening economic relations between African countries and Uzbekistan. 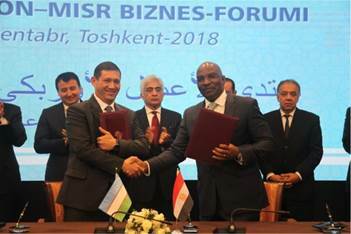 The agreement, which was signed on 5 September on the sidelines of the Egyptian-Uzbek Business in Tashkent, will see the two banks financing Africa-Uzbek trade valued at up to $50 million, on a non-committal basis, under the economic development initiatives of the Government of Uzbekistan. The agreement will also have Afreximbank and NBU cooperating in the promotion of business opportunities for Uzbek and African entities in Uzbekistan; supporting exporters and importers in Africa and Uzbekistan; and supporting investments by African entities in Uzbekistan. Denys Denya, Executive Vice President, Finance, Administration and Banking Services, signed the agreement on behalf of Afreximbank, while Alisher Mirsoatov, Chairman of NBU, signed for his institution. Speaking at the signing ceremony, Mr. Denya said that the agreement would make it possible for the institutions to consult, cooperate, exchange information and share views on areas of common interest in order to foster business opportunities and mutual cooperation. NBU had invited Afreximbank to join the Egyptian delegation, led by President Abdel Fattah El Sisi, to the Egyptian-Uzbek Business forum. Also joining the delegation were Dr. Sahar Nasr, Minister of Investment and International Cooperation, and Amr Nassar, Minister of Trade and Industry, as well as a number of prominent Egyptian businessmen.